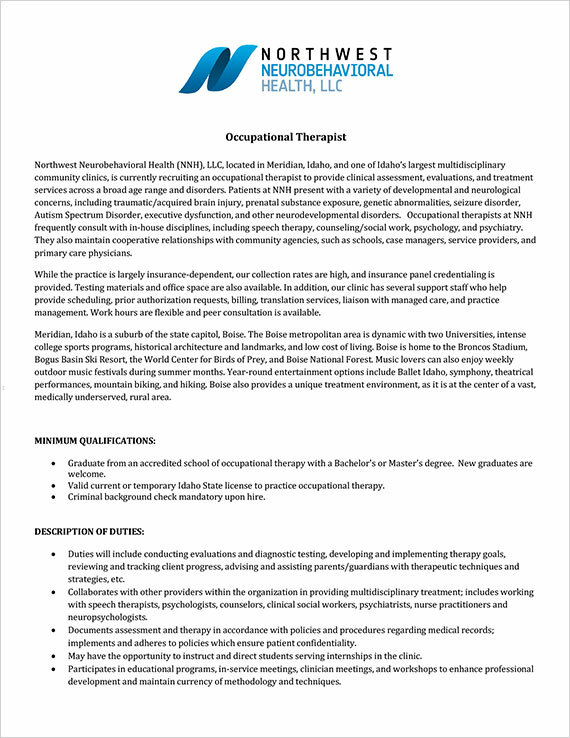 Northwest Neurobehavioral Health (NNH), LLC, located in Meridian, Idaho, and one of Idaho’s largest multidisciplinary community clinics, is currently recruiting an occupational therapist to provide clinical assessment, evaluations, and treatment services across a broad age range and disorders. Patients at NNH present with a variety of developmental and neurological concerns, including traumatic/acquired brain injury, prenatal substance exposure, genetic abnormalities, seizure disorder, Autism Spectrum Disorder, executive dysfunction, and other neurodevelopmental disorders. Occupational therapists at NNH frequently consult with in-house disciplines, including speech therapy, counseling/social work, psychology, and psychiatry. They also maintain cooperative relationships with community agencies, such as schools, case managers, service providers, and primary care physicians. While the practice is largely insurance-dependent, our collection rates are high, and insurance panel credentialing is provided. Testing materials and office space are also available. In addition, our clinic has several support staff who help provide scheduling, prior authorization requests, billing, translation services, liaison with managed care, and practice management. Work hours are flexible and peer consultation is available. Meridian, Idaho is a suburb of the state capitol, Boise. The Boise metropolitan area is dynamic with two Universities, intense college sports programs, historical architecture and landmarks, and low cost of living. Boise is home to the Broncos Stadium, Bogus Basin Ski Resort, the World Center for Birds of Prey, and Boise National Forest. Music lovers can also enjoy weekly outdoor music festivals during summer months. Year-round entertainment options include Ballet Idaho, symphony, theatrical performances, mountain biking, and hiking. Boise also provides a unique treatment environment, as it is at the center of a vast, medically underserved, rural area. Graduate from an accredited school of occupational therapy with a Bachelor’s or Master’s degree. New graduates are welcome. Valid current or temporary Idaho State license to practice occupational therapy. Criminal background check mandatory upon hire. Duties will include conducting evaluations and diagnostic testing, developing and implementing therapy goals, reviewing and tracking client progress, advising and assisting parents/guardians with therapeutic techniques and strategies, etc. Collaborates with other providers within the organization in providing multidisciplinary treatment; includes working with speech therapists, psychologists, counselors, clinical social workers, psychiatrists, nurse practitioners and neuropsychologists.